Work through the following activity to discover the relationships between shapes heights, radii, and volumes. 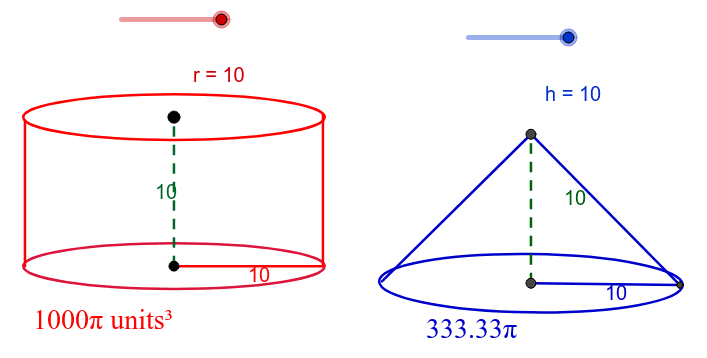 How does the volume of a cone change with a change in radius? What about a sphere? Record all your answers on a sheet of paper or type answers to turn in when you complete the activity. If you choose to type, you must provide a separate sheet of paper for any work. Answer questions completely and carefully. You must explain all your answers for full credit. Sketch diagrams or include screen shots as needed to aid your explanations. How does the volume of a cylinder change when its height changes? 1) Record the starting dimensions and volumes. 2) Now use the vertical sliders to change the height of the red cylinder (do not change anything for the blue cylinder). Cut the height in half. 3) Does cutting the height in half cut the volume in half? Compare the red and blue cylinders. 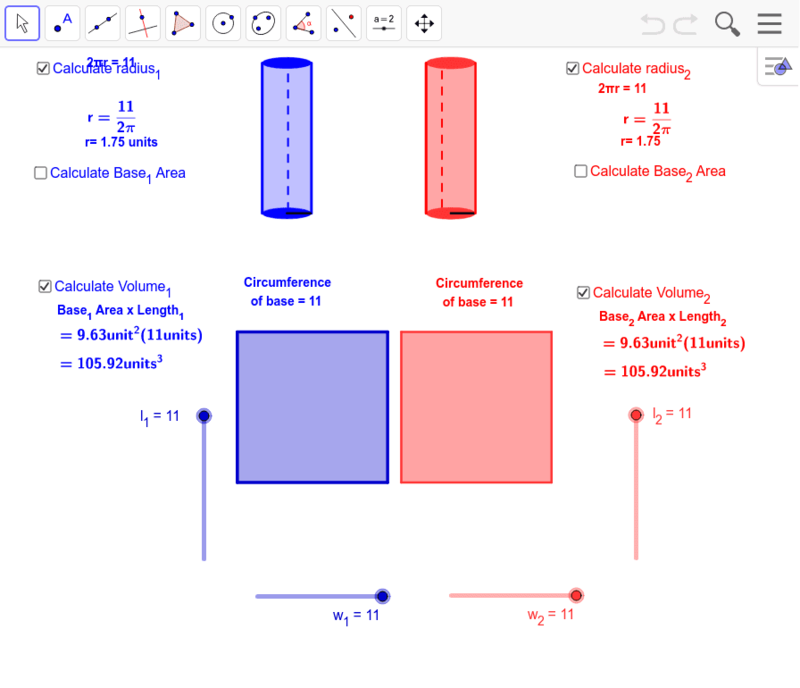 4) Create a table of 5 different heights and their effects on the volumes of the cylinders. 5) Write a sentence or so describing how changing the height changes the volume of a cylinder. Think about the equation for the volume of a cylinder. How might that explain the relationship that you are noticing? 6) Now reset the height back to your original height (11 units). Do you think cutting the radius in half will cut the volume in half? Why or why not? 7) Look at how the radius is being calculated in the upper right hand corner. Make sure you look at that number for radius. The number on the slider is the circumference. 8) Use the red slider for circumference to cut the red cylinder's radius in half. How did that affect the volume? If it did not get cut in half, what % did it change? 9) Create a table of 5 different radii and volumes at the same height. 10) How does changing the radius of a cylinder change its volume? How might the volume formula for a cylinder help explain that relationship? 11) Record the dimensions and volume of the cone. 12) Now use the slider to change the height of the cone (do not change the radius). Cut the height in half. 13) Does cutting the height in half cut the volume of the cone in half? 14) Create a table of 5 different heights and their effects on the volumes of the cones. 15) How does decreasing the height effect the cone verses the cylinder? 16) Now reset the height back to your original height (10 units). Do you think cutting the radius in half will cut the volume in half? Why or why not? 17) Use the slider for radius to cut the cone's radius in half. How did that affect the volume? If it did not get cut in half, what % did it change? 18) Create a table of 5 different radii and volumes at the same height for the cone. 19) How does changing the radius of a cone change its volume? 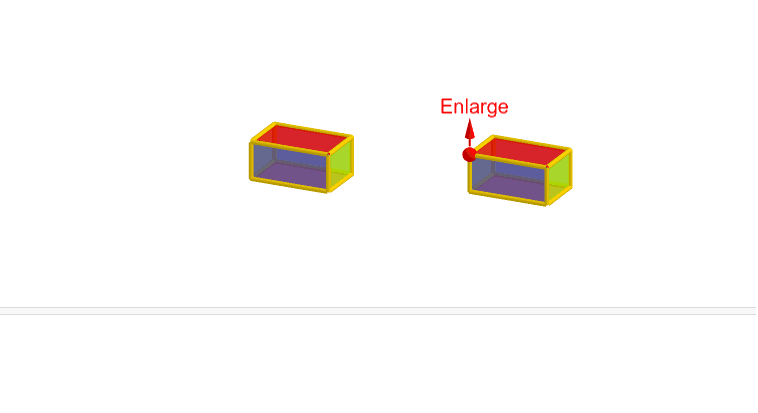 20) What is the ratio of the volume of the smaller cube to the volume of the larger cube? 21) What is the ratio of the surface area of the smaller cube to the surface area of the larger cube? 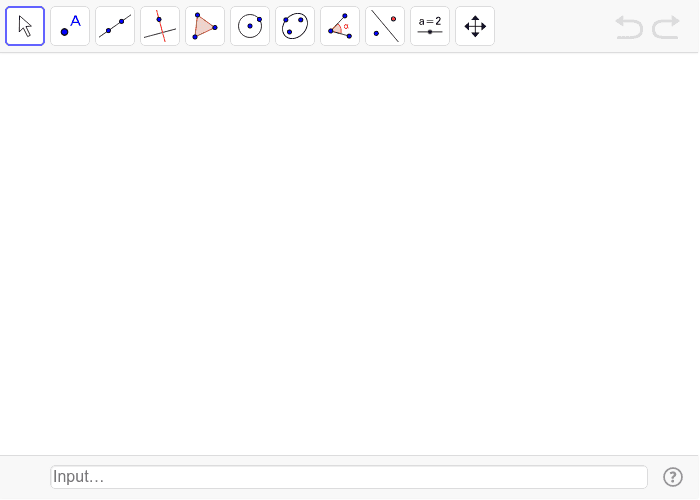 Play around with geogebra in the work space below. Try to create shapes or graphs, change their dimensions, measure angles, or whatever else seems interesting. See what all the tools do and try to gain a level of comfort with the program. 22) Write a short (2-3 sentence) reflection on your thoughts on Geogebra thus far. Do you like it? Does it seem confusing? Did this activity help you see some new relationships?